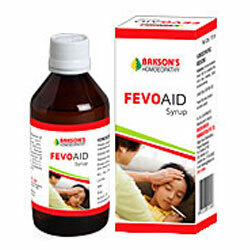 Buy Bakson's Homeopathy Fevo Aid Syrup anti-pyretic that assists the body in relieving the accompanying discomforting symptoms. Forms an important part of the body's defense against infection. Fever is the temporary increase in body's temperature, above the normal 98.60F (370C), in response to some disease or illness. It forms an important part of the body's defense against infection. ‘Fevo Aid' is an effective homoeopathic anti-pyretic that assists the body in relieving the accompanying discomforting symptoms. Adults : 1 tablespoon, every 3-4 hours. Children : 1 teaspoon, every 3-4 hours.